Ready to get in the Christmas spirit? There's no better place to start than Sevierville, Tennessee, and the 26th Annual Smoky Mountain Winterfest. From now through February 29, 2016, you can drive or walk through beautiful downtown Sevierville and take in more than 15 million sparkling Christmas lights. Start your tour at the Sevierville Visitor Center, where you can pick up a tour map and your Winterfest in 3D glasses, then watch as over 25 miles of twinkling lights transform into beautiful snowflakes right before your eyes. 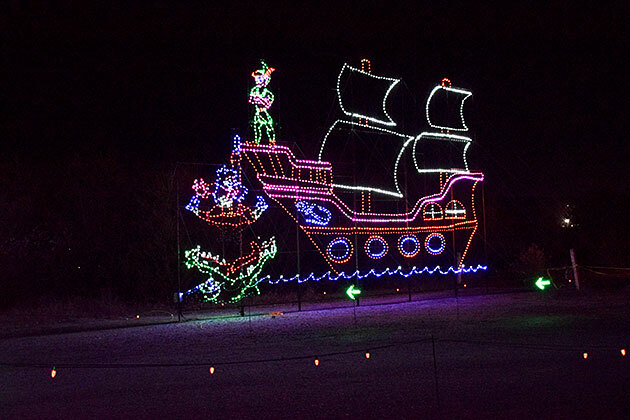 Favorite stops include Bears Fishing in the Creek and Old Man Winter and the North Pole, and in between you'll enjoy sparkling trees, lighted bridges, and many other creative and delightful lighted holiday displays. Winterfest is a beloved tradition for locals and visitors alike. This year's attractions include Shadrack's Christmas Wonderland at Smokies Stadium, a 1.5-mile drive through an LED Christmas light experience like you've never seen before. Starting at dusk, you can drive through a winter wonderland of lights and lighted decorations, carefully synched with Christmas music from a local radio station. This show has won awards and gotten press from all over the nation, so you won't want to miss it. After you've seen the lights, there are plenty of other fun activities for kids at Shadrack's too, including a visit with Santa. Through January 2 at the Smoky Mountain Palace, the whole family can enjoy a brand-new stage show featuring local singers and dancers, plus the art of Thomas Kincaid. Thomas Kincaid's Christmas of Light brings the painter's most beloved Christmas scenery to life, accompanied by music with messages of hope, joy, faith and family. The fun doesn't end on December 25, either. If you're a book lover, plan to visit Winterfest on February 27 for the Rose Glen Literary Festival at Sevierville Convention Center. The Rose Glen Literary Festival features workshops as well as local and regional authors — an exciting and inspiring day for readers of all ages. Winterfest visitors will also enjoy the unique ambiance of Sevierville and the Great Smoky Mountains at Christmas. There's something especially peaceful and quiet about the mountains in winter that will remind you of simpler times gone by. The best way to enjoy everything Winterfest has to offer is to rent a cabin and plan some quiet time. Enjoy an exciting trip through the light shows and activities of the festival, then return to your cabin for a cup of cocoa and reading or board games in front of a crackling fire. Be sure to bring your binoculars and birding guide, and keep an eye out for deer, squirrels, foxes and other indigenous mountain friends. Winterfest in Sevierville is a great excuse for a holiday getaway in the Great Smoky Mountains, and it may just become a family tradition. Rent a cabin from Volunteer Cabin Rentals with someone special or with the whole family, bring your hats and gloves, and get ready for a holiday break that is equal parts excitement and quiet reflection. Jon Hoffman is Reservations Manager of Volunteer Cabin Rentals specializing in Smoky Mountain cabins near Gatlinburg and Pigeon Forge, TN. Visit them today at http://www.volunteercabinrentals.com to book cabins for weddings, vacations, reunions and other special events.